United Nations, Oct 2 (IANS) UN Secretary General Ban Ki-moon Wednesday urged the world to be inspired by the courage shown by Mahatma Gandhi, the apostle of non-violence who was born on this day in 1869. 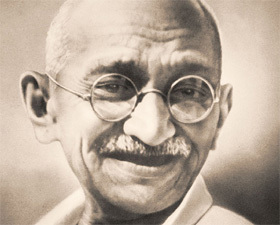 “Today we celebrate the birthday of Mahatma Gandhi and his resonant legacy of non-violence,” Ban said in a statement. “Gandhi showed the power of peacefully opposing oppression, injustice and hatred. His example has inspired many other history-makers such as Martin Luther King Jr., Václav Havel, Rigoberta Menchú Tum and Nelson Mandela,” he said. He said the UN stood for peaceful resolution of disputes and an end to all forms of violence. “Ending such violence can start with each of us – in homes, schools and workplaces. Violence can be contagious, but so can peaceful dialogue,” he said.